Protecting critical habitat for Asia's endangered cranes. Muraviovka Park was established in 1994 to protect one of the few remaining undisturbed wetlands within the immense floodplains of the Amur Basin of Northeast Asia. Covering 16,000 acres of wetland and cropland leased from the local government until the year 2058, the park is the first nongovernmental protected area and the first privately operated nature park in Russia since 1917. This wetland, with the adjacent croplands, provides critical habitat for more than 500 species of plant, and 200 species of birds, 20 of which are rare or endangered—most notable are the six species of elegant cranes which use the area for nesting and raising their young. The wetlands have been designated as a Ramsar site—a resource of global significance. Directed by Dr. Sergei Smirenski, the park’s mission integrates human and wildlife interests for a sustainable future. Combining research, protection, restoration, management of endangered wildlife species and their habitats with sustainable land use and education, the park has worked to have an impact on the surrounding farms and communities. The success of the park is in identifying and aiding the needs of local people by understanding their way of life and working with them to accommodate that alongside the needs of the wildlife. With this approach, the park is able to win trust, respect and cooperation from local and international people and organizations who share a vision for healthy co-existence of migratory water birds and people. Wildfires near the park happen twice every year, in the spring and fall, started by farmers who burn unneeded straw in their crop fields and dead grass in the hayfields and pastures. Bird nests, eggs and chicks, as well as many mammals perish in those fires, which on windy days can cause these fires to move into the park – with devastating effects. Since 1996, Muraviovka Park has been conducting a complex fire prevention and suppression program to offset negative impacts of grass fires on wildlife. The program includes prescribed burning in spring and fall to set up fire breaks that protect the park in the event of uncontrolled wildfires, however in fall of 2011, the prescribed burn permit was denied. On October 8, 2011, a fire moved through the park, burning 12,000 acres of crane wetlands, as well as two cabins, 20 acres of soybeans and the park arboretum planted by park staff, supports, and local school children and their teachers. Russian wildlife artist Vadim Borbatov created “The Exodus,” a painting depicting a family of red-crowned cranes feeling the wildlife, which was presented to the park and will be exhibited in Blagovehchensk in 2013. Vibrant symbols of life to many Asian cultures, cranes depend on the vast grasslands of the Amur Region as a breeding and chick rearing location. Red-crowned cranes are renowned for their spectacular and elaborate courtship dances, gracefully circling each other while leaping and calling, head-bobbing toward one another and bowing with spread wings. These dances continue throughout the year as the birds continually reinforce their pair bonds. In addition to endangered Red-crowned Cranes, Muraviovka Park hosts Vulnerable White-naped cranes, Endangered Oriental White storks and many endangered plants species. In spite of wildfires, productive nests have been found. One of the crane nests is located just 250 yards from the Park’s Education Center, so visitors re able to watch them from behind masking netting from the Center’s balcony. Additionally, the Center’s captive pair of Red-crowned cranes successfully reared two healthy chicks. A captive-reared crane was was released at Khinganski Nature Reserve into a wild flock of cranes, successfully integrating and leaving the park during the migratory period. 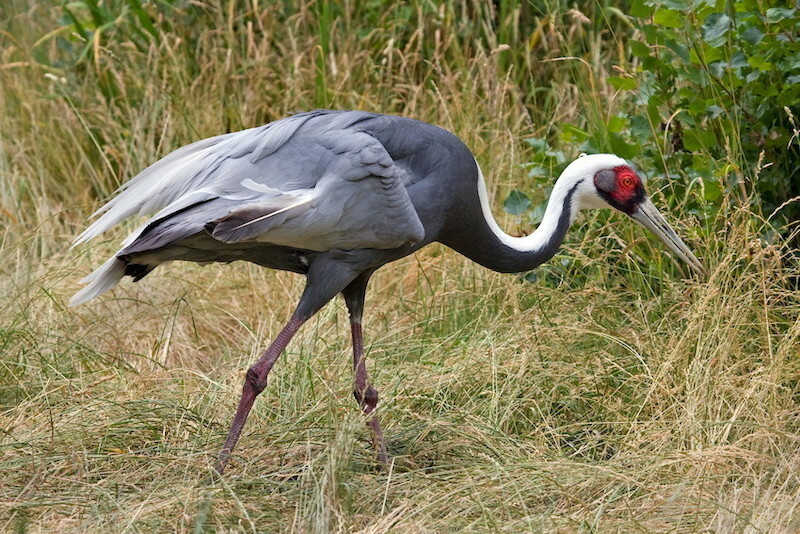 Woodland Park Zoo has fully participated in the AZA’s Species Survival Plan for the Red-crowned and White-napped cranes for many years, successfully raising several of both species here. SSPs include conservation-oriented research, breeding of selected animals to maintain genetic diversity and cooperative educational efforts. The pair of birds on exhibit at Woodland Park Zoo was received in 1992 from Kobe Zoo, Japan.